alaTest har samlat in och analyserat 158 tester för Q ACOUSTICS MEDIA 4 (M4). Det genomsnittliga betyget av denna produkt är 4.6/5, att jämföra med genomsnittsbetyget 4.5/5 för produkter i kategorin Hemmabio. Vi har analyserat betyg från experter och användare, produktens ålder och andra faktorer. Jämfört med andra produkter i kategorin Hemmabio belönas Q ACOUSTICS MEDIA 4 (M4) med en alaScore™ på 89/100 = Mycket bra kvalitet. Great sound. Simple to use. Was fed up with my old soundbar as it sat in front of the tv and looked like an afterthought. This one sits neatly in the tv cabinet and sounds brilliant! if i could get it to work properly!!! Issues with the interface with the TV & Humax Freesat Box. No Tech Support phone number and no response to emails. Will give Q Acoustics another week before I return it!! I bought this a week ago. It was very easy to set up and is a great enhancement to our TV audio experience. 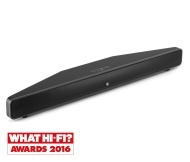 I am very pleased with my Q Acoustics sound bar, as I wear hearing aids not all sound bars are very clear when listening to speech but this is. very well built, great sound. I bought this soundbar two weeks ago and wish i had bought it months ago. Its great for music,tv, and films.